In most of the talk about marriage today, government or individuals seem to take front and center place. Nothing could be further from the truth of Scripture. 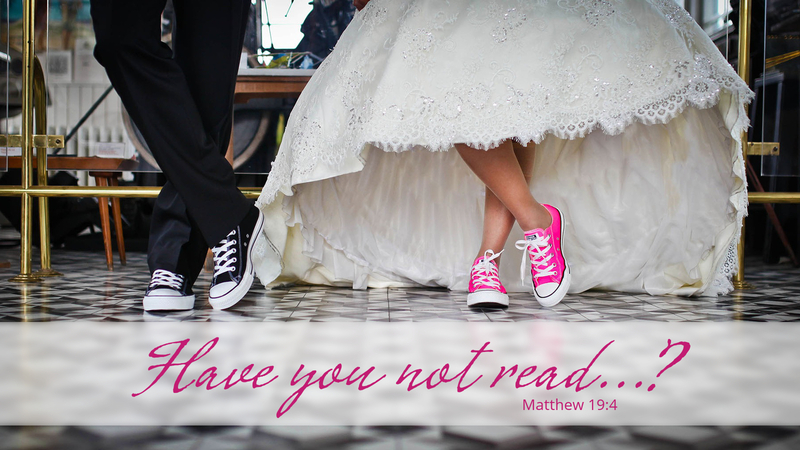 God is the one who is paramount in marriage, not the individual or the state. There are times when we fall prey to emotional arguments which often hinge on significant subjects such as marriage. Yet marriage is the creation of God himself and his instrument for humanity. We need to keep the focus of such matters in context and put God at center stage and nothing else. Prayer: Father, help us keep our eyes on you and not be swayed from your word. Amen. Today’s devotion was written by Carlin Ours, Pastor of Organ Lutheran Church, Salisbury, NC. We had started a building project at our mission in the Philippines and it was decided to hire a pastor to oversee the work being done. Pastors in the Philippines, especially in poor areas like ours, need to have a job to make money for them and their family to live on. He was testing me to see where my belief in the bible held true, He asked me first if I believed in divorce. I told him that as per the Bible, the couple could only divorce for marital unfaithfulness. In their culture, a couple will move in together and declare that they are husband and wife since to do it legally requires a lot of time and money that they do not have. But, I said that the Bible would not allow a divorce in any other circumstance. A few other questions later and I was approved by him to be a leader with my wife at the mission. So does this mean if you don’t have a wedding with a pastor you are not married?? I have always wondered that. It makes sense.